Full-flavoured English tomatoes with thyme and garlic breadcrumbs make a tasty vegetarian starter. Preheat the oven to 180º°C, gas mark 4. Place the tomatoes on a baking tray cut-side up and sprinkle with the sugar. Scatter over the thyme leaves and half the garlic, drizzle with the tablespoon of olive oil and season. Roast for 15-20 minutes or until softened and juicy, then remove from the oven. Meanwhile, heat a dry non-stick frying pan and add the breadcrumbs. Cook over a gentle heat with the remaining garlic for 2-3 minutes, stirring occasionally, until the crumbs are golden. Remove from the heat and leave to cool. Stir in the parsley. Mix together the ingredients for the dressing. Season with a little freshly ground black pepper. Toss the rocket very lightly in some of the dressing and place a mound in the centres of 4 serving plates. Arrange 4 roast tomato halves on each plate. Spoon a little extra dressing around the tomatoes and then scatter the breadcrumb topping over. 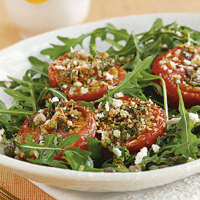 Serve immediately, or leave the tomatoes to cool then serve as a cold salad. The tomatoes can be cooked up to 24 hours ahead then kept covered in the fridge until needed. Serve at room temperature. Add a pinch of dried chillies to the salad dressing for extra flavour.